Best thing about the Shoprider Jimmie is its maneuverability which comes from an incredibly tight turning radius of 15.5”. It can be dismantled into three relatively lightweight parts. Does not come with any storage space or basket. The battery pack cannot be removed from the front chassis for lighter assembly/disassembly/storage. 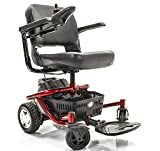 If you are in search of a travel friendly, highly maneuverable power wheelchair that is also not too hard on your wallet, then the Shoprider Jimmie Power Wheelchair might be exactly what you are looking for. 1. 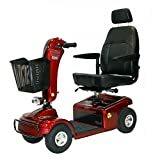 Maybe the best thing about the Shoprider Jimmie is its maneuverability which comes from an incredibly tight turning radius of 15.5”, which solves the problem of the small bathrooms which can make restaurants so difficult. Its also handy in elevators or on those tight turns in the aisles of your favorite clothing store! 2. It can be dismantled into three relatively lightweight parts, making it easy to store in the car trunk for traveling. The seat (24 lbs. ), the front chassis (with batteries 52 lbs. – batteries and pack weigh 20 lbs.) and the rear chassis (with drive train 30 lbs.) have a total weight of just 106 lbs. 3. A suggested maximum user weight of 250 lbs.and a top speed of 3.75 mph. 4. 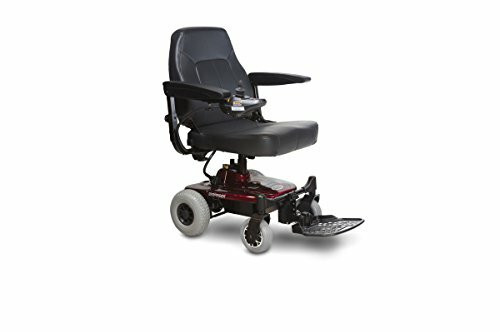 With a driving range of 10+ miles from two 12v 12Ah (SLA – Sealed Lead Acid) batteries, which can take up to 12 hours to charge, this chair gives impressive service. The charging port is under the joystick/controller and the controller can be fitted to suit either right or left-handed users. 5. Though the captain’s seat (18” wide) doesn’t swivel it does recline and tip forward, saving space for car trunk or closet storage. The reclining seat lever, located on the left side of the wheelchair below the armrest, adjusts the seat from 1” to 3” in 1” increments. The well-padded armrests can be adjusted for width, height and angle as can the large footplate. The seatbelt is also adjustable. 6. The rear-drive wheels have 9” flat-free tires and there are two anti-tip wheels in the back. 7. The ground clearance of 2.25” really helps when crossing grass or uneven ground. 8. As with most Shoprider units the controller can be locked to prevent unauthorized use. The locking/unlocking is achieved through a sequence of key presses and joystick movements. The frame and electrics come with a one-year (limited) warranty and the batteries are warranted (limited) for six months. Although it may seem petty, one major complaint I’d have is that the wheelchair does not come with any storage space or basket. The seat can get uncomfortable after you have been sitting in it for a while. 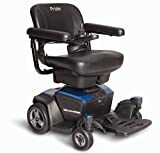 In my opinion, if you’re looking for lightweight, portable transport you really have to be a perfectionist to find anything other than minor flaws in the Shoprider Jimmie Power Wheelchair. I could find hardly anything wrong with this unit. Shoprider is a brand with which you can’t go wrong. All of their products are well thought-out, user-friendly, and are known to be very reliable. And at the price it retails for I consider it it to be a really decent investment.